A neuroscience researcher successfully used M3-LS Linear Smart Stage assemblies for positioning of probes during in-vivo recording. 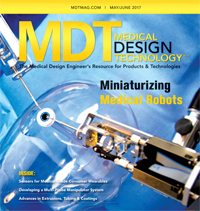 New Scale engineers then collaborated on an integrated multi-probe positioning assembly to meet the needs of this market. For more than a decade New Scale has been delivering M3 MOTION MODULES to customers who manufacture instruments and devices. With a unique all-in-one design and embedded controller, M3 embedded motion modules are easy to integrate and reduce overall system size and cost. 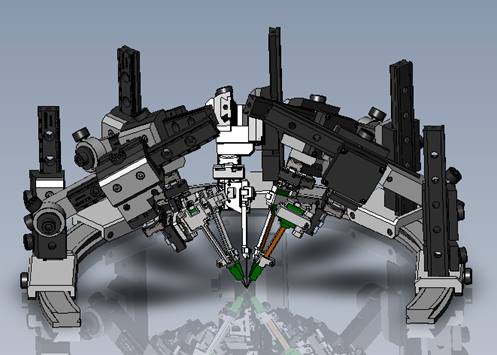 They are ideal building blocks for creating flexible, simple-to-install, and easy-to-operate multi-axis systems. 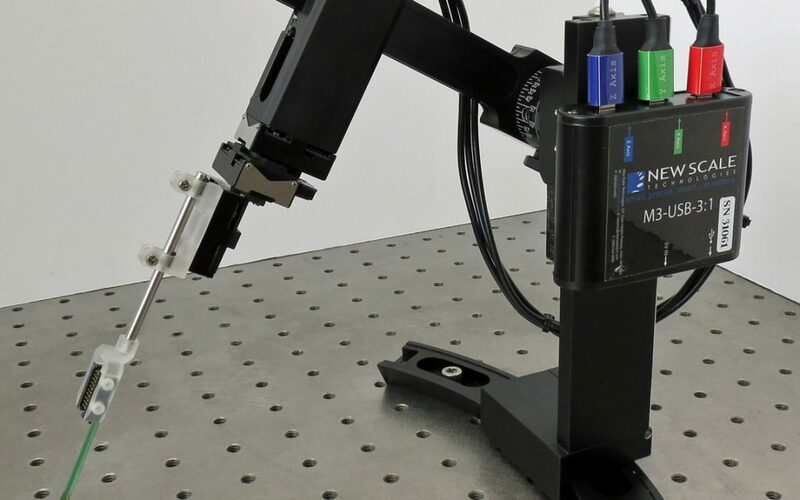 Recently New Scale developed a multi-probe micromanipulator system using its M3 embedded motion modules. In 2016 New Scale began a formal collaboration with Dr. Josh Siegle of the Allen Institute to create and commercialize a Multi-Probe Micromanipulator (MPM) system for neuroscience research. Dr. Siegle had already successfully collected data using New Scale’s M3-LS-1.8-6 Smart Stages in his multi-probe experiments. This work validated the performance of the three-axis M3-LS stage assemblies, in a three-probe experiment. It also highlighted opportunities to improve the flexibility, speed of installation, and ease of use. In only a few months, New Scale’s engineering team worked side-by-side with Allen Institute to create a multi-probe system solution that meets the needs of a broader research community doing acute in-vivo recording. This community is working with the newest generation of silicon probes fabricated using microelectronic manufacturing (integrated circuit) processes. The result is tiny needle-shape tips, with tens to hundreds of recording channels, that must be precisely inserted in the brain of test animals. Ongoing collaboration with the Allen Institute continues to yield new ideas that New Scale is quickly transforming into new product features. The MPM can be ordered in an upright or inverted configuration to accommodate different animal task environments. An optional joystick control is now available, and new mounting brackets are being created for a diverse and growing list of commercial silicon probes. A New Scale Pathway software application, customized for the MPM system, controls all five probes – 15 axes of motion – from one screen. Joystick control is optional. As in all research applications, less time spent positioning the recording equipment means more time available to record data.